We’ve showcased the gorgeous wedding of Laura before on the blog, and now we’re bringing you some of her DIY projects!! First up are these neat table numbers using picture frames. Our DIY Table Numbers were the perfect kind of wedding project – simple & easy to make, yet personal and unique. I loved the idea of giving our guests a few random tidbits of information about the hubs & I as a couple, especially considering some of our guests were meeting one of us for the first time! See the rest of the DIY after the jump! Anyway, when I saw these wooden picture frames for $1 a pop, inspiration struck. 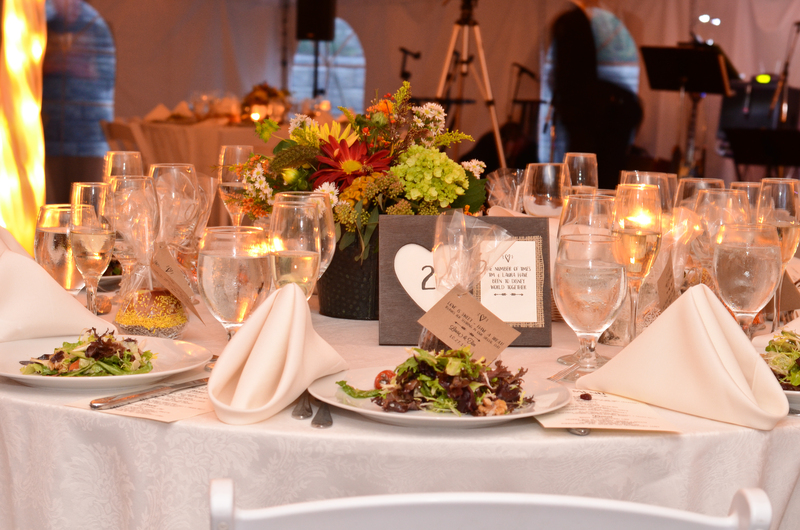 I loved the heart-shaped window for the table number, since the heart was a theme throughout our wedding stationary and decor. The space to the right of each window could have been filled with lots of different and fun things- a different picture of the couple on each table, a meaningful quote or song lyric, or a pretty burlap or paper flower adornment. I opted for some fun, unusual, and silly facts about our relationship. I printed the table numbers on paper leftover from my DIY invitations, using the same Campland font as seen throughout my self-designed paper products of the day. Then I simply traced the cardboard heart insert from the frame to cut out each number. I left the cardboard behind the table numbers in the window for some reinforcement. The facts are printed on my invitation paper, glued to a rectangle of burlap, then onto the frame. I used wood glue to attach the burlap to the frame, and it held perfectly. So, what do you think? Slightly more interesting then a simple number, right? And maybe our guests learned some silly new facts about us. I enjoyed this project- and I think hubby did as well, since we had fun working together to come up with the little facts. This project only cost $15 – the price of fifteen frames, since I already had the paint, paper & burlap! For more DIY projects from our wedding, check out the Our Wedding Page! Thanks Laura! This article originally appeared on her blog, Some Kind of Lovely Ride. Make sure to check it out!